Lippy Girl Vegocentric Abraca-Bam is a long-lasting, moisturising lipstick which comes in a 100% recyclable aluminium tube. Lippy Girl Vegocentrics are simply the best vegan lipsticks, they do not contain any bee products, polybutene or petroleum. This premium line of amazing vegan lipsticks are made with organic, wildcrafted natural oils, waxes and only natural mineral pigments. Lippy Girl lipsticks are made with certified organic castor seed oil, jojoba seed oil, carnauba wax and shea butter for the smoothest, creamiest finish. 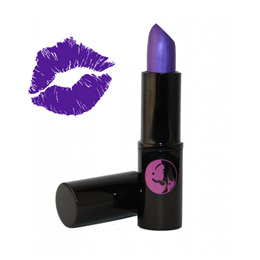 This lipstick is also super pigmented with natural minerals. Lippy Girl lipsticks use a base of organic shea butter making them softer than other lipsticks with a beeswax or polybutene base. Ricinus Communis (Castor) Seed Oil*, Simmondsia Chinensis (Jojoba) Seed Oil*, Butyrospermum Parkii (Shea Butter) Fruit*, Copernicia Cerifera (Carnauba) Wax*, Euphorbia Cerifera (Candelilla) Wax, Citrus Aurantium Dulcis (orange) Peel Oil*,Tocopherol, may contain (+/-) Mica (CI 77019), Tin Dioxide (CI778161), Titanium Dioxide (CI 77891), Iron Oxides (CI 77491, CI 77492,CI 77499), Manganese Violet (CI 77742), Calcium Aluminium Borosilicate, Silica *. *Certified Organic Ingredient. The first application is fairly sheer, the colour is buildable for extra intensity. It is recommended that you only raise the bullet in the tube minimally when applying, as they are very soft and creamy. Alternatively, use a lip brush. Below are reviews of Lippy Girl Vegocentric Vegan Lipstick - Abraca-Bam 5g by bodykind customers. If you have tried this product we'd love to hear what you think so please leave a review.